At least, that's what the physicians told us when we contacted them about a refresh of the interface they'd been using. They'd become pretty used to and fond of the existing experience. Which lead to an interesting question for both Product and Design: How do you justify updating a system which, according to your audience, doesn't need updating? You dig a little deeper, of course. But first: it's useful to understand a bit of how Grand Rounds (GR) works, and in particular what it offers its patients. Grand Rounds aims to match patients with the best possible doctor for their present health issue, whether that doctor is around the corner or at a teaching hospital 1,000 miles away. It works like this: patients arrive at grandrounds.com, sign up, and elect to start a "case" (an interaction with GR). Once a case has been started, a patient tells GR about what's currently going on health-wise. If the patient hasn't already seen a specialist locally about their condition, GR will work to find a nearby spcialist to review their issue in person. If the patient has already seen a specialist in person, GR will attempt to get them a "remote second opinion". Remote second opinions work much like an in-person second opinion, they just happen to occur over the internet. GR will locate the best possible physician to review a patient's case, and that case is routed to the partner physician. In order for the partner physician to be able to render their second opinion, they access an online tool: the Expert Physician Portal (EPP) in order to review a patient's medical history, review medical records, and imaging. 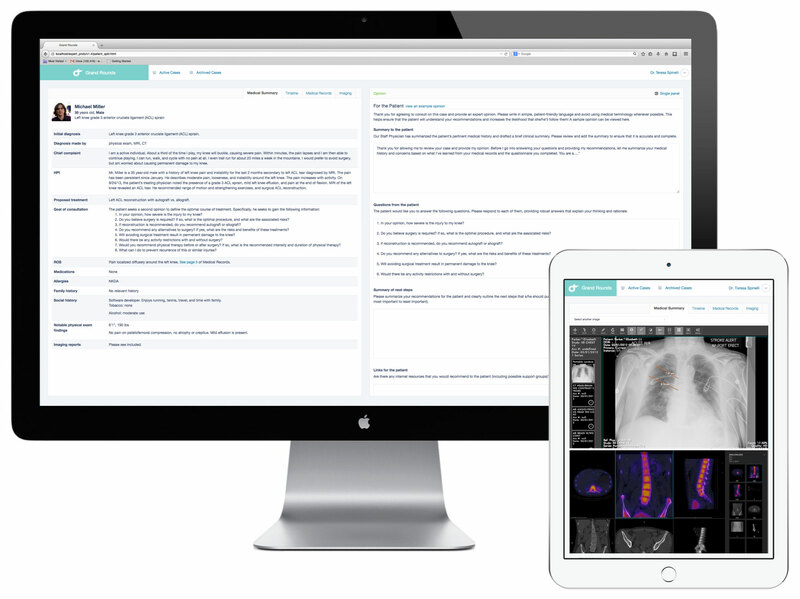 The tool also provides for a way to compose the second opinion and submit it to GR for review and distribution to the patient. At the outset, we knew the existing 2013 portal (not shown) could be improved upon with the ultimate product goals being "faster, higher quality opinions" from our expert physician partners. The work that's showcased here is some of what was involved in the re-design of the portal. 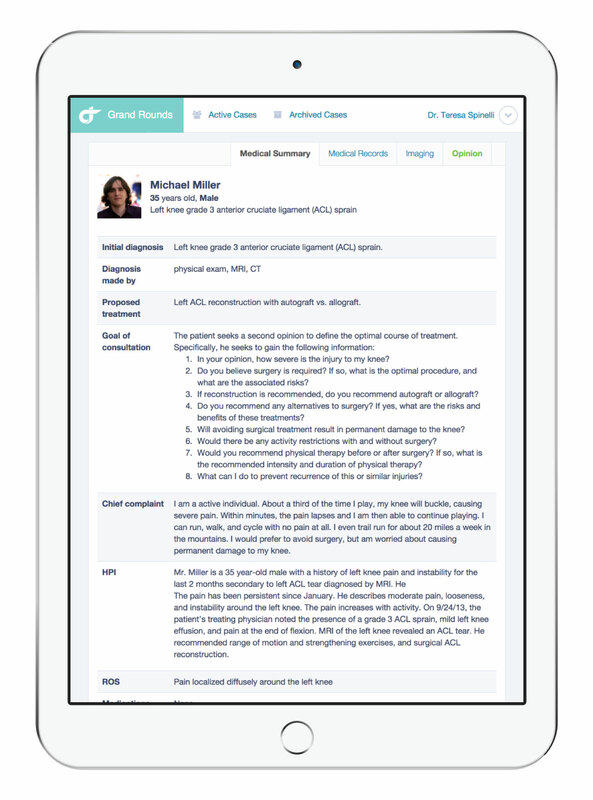 The Grand Rounds Expert Physician Portal, used for reviewing a patient's medical information and composing a second medical opinion. And now, back to that whole "don't change a thing" thing. To understand why the physicians we were speaking with were somewhat change averse, we decided to go out and sit with them to understand what their world consisted of. We had numerous questions related to the ways in which they used the expert portal in its first incarnation, how they thought about second opinions more broadly, how they worked independent of the expert portal, and in particular, any ad-hoc processes they might have developed to manage around any shortcomings of the first version of the portal. Beware the "death by 1000 papercuts". While many of the physicians we met with were able to navigate and operate the first version of the expert portal, the accrual of "small gotchas" over time in the UI was enough to meaningfully slow down the work as it was being performed. "Small gotchas" included things like saving state when switching between tabs, optimizing page loading time, and patient imaging snafus, among others. It was only after the physicians sat down with us and started feeling the "pain" of each papercut that they started to acknowledge that the experience really could use some improving, and we quickly generated buy-in from them once that became apparent. Time is more valuable than (almost) anything. This one may go without saying given what most people know about doctors already, but it's an important one to keep in mind, especially when designing for them. Time spent learning a new piece of software or UI is time spent away from patients or practitioning, and that's simply not acceptable for many physicians. This speaks to both the learnability of an updated UI, and also the need to be judicious and careful with regard to subequent releases over time. Don't underestimate the power of the spoken word. About half of the physicians we spoke with preferred to dictate their opinions versus typing them. This was a surprise to the team as there was a loosely held assumption that "nowadays" physicians would likely prefer to type their opinion. It became immediately apparent that many of the expert physicians we spoke with had a similar need to place relevant medical events leading to the second opinion along a timeline. When we visited with them in their offices, they would grab a piece of paper or fire up a word document on which to make notes related the case. This helped them to form a clear picture of any contributing, compounding, or co-occurring factors that may have an impact on where the patient stands today. Reclaiming their time: Based partially on the feedback we heard from physicians in our early testing group, we conceieved of and designed a feature called "@ (at) phrases". The feature helps physicians to avoid repetitive typing or the need to maintain a document from which they would copy and paste bits of frequently used text. Here, a high fidelity prototype I developed in HTML/jQuery to prove out the interaction is shown. 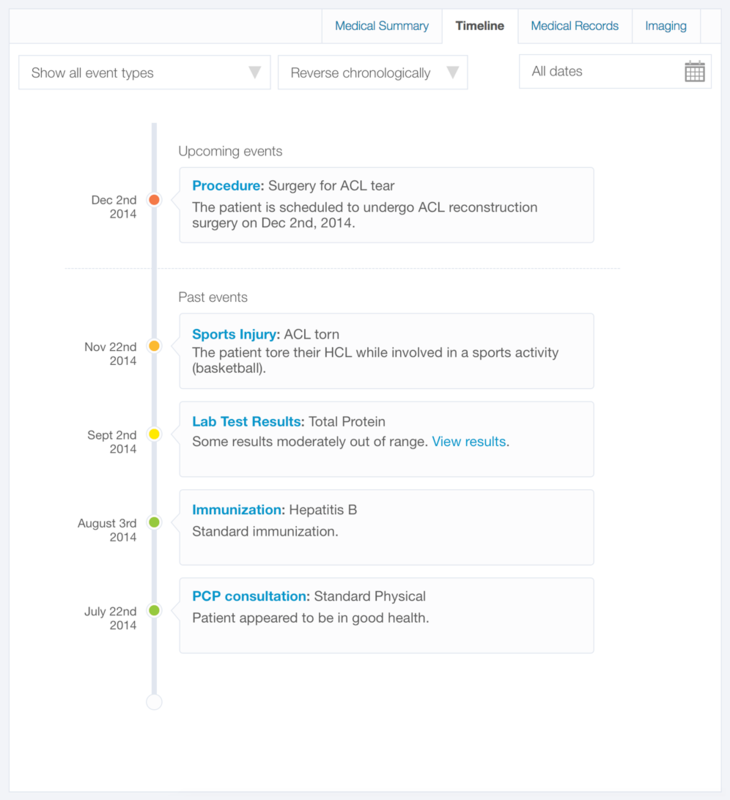 Well timed: A timeline of salient events related to the patient's primary complaint is visible to the physician in the UI. This is a time saver as it often saves the expert physician from having to construct the timeline themselves. Timelines are created ahead of time by Grand Rounds Staff Physicians to save time all around. In addition to the overall timeline concept, I help conceive of and prototype a bespoke timeline creation tool which maps to the overall workflow seamlessly. Care to give it a try? I built a prototype using Bootstrap (and a bit of jQuery) just for that purpose.